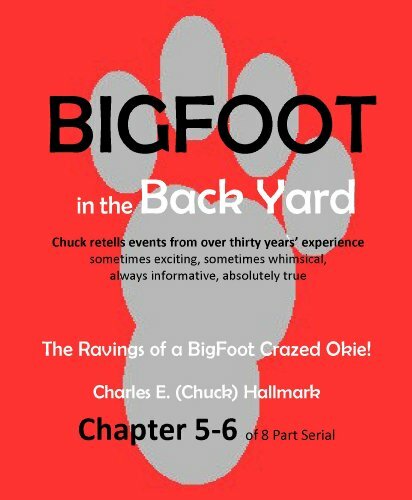 Big Foot in the Back Yard: The Rantings of a Big Foot Crazed Okie! Charles (Chuck) Hallmark was a big foot researcher for decades. He worked and gathered evidence and experiences very quietly and without a lot of fanfare. He had some notariety such as being the cover story in "Oklahoma Today" magazine and was well known in BF circles.This delightful and informative book records and reflects the adventures, ideas, thoughts, and information that Chuck wanted to leave to his family and friends. All events are true, all photos are genuine. Chuck respected the power and the intelligence of Big Foot, but saw and found no danger in the creatures he encountered and hoped to leave that image for the world.Chuck died in 2008 after enjoying 30+ years of interaction with these creatures, gathering foot print molds and fingerprints as well as other evidence. He had great respect and regard for the BF communities, clubs, groups, and individuals out there. With pictures and stories the Bords present cases of encounters with Bigfoot. 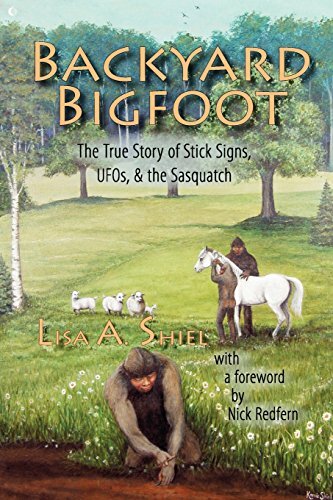 The Bigfoot story has moved from certainty of the creatures existence to claims of hoaxes, trickery, and outright lies and back again. Roger Patterson and Bob Gimlin claim to have taken movies of Bigfoot; Ray Wallace s family shows wooden feet that they claim were used to start the whole Bigfoot story in 1958. Who do we believe?The Bords answer is nobody and everybody. The cases are presented without prejudice so you can make up your own mind. Sometimes it s easy, as with the Ray Wallace claims there are plenty of sightings before Ray Wallace was alive to make it clear he didn t start the whole thing. Other cases are a mystery. And that s all part of the fun. The ultimate quest for the world's most mysterious creatures.The Loch Ness Monster, Bigfoot, the Abominable Snowman -- these are the names of the elusive beasts that have caught the eye and captured the imaginations of people around the world for centuries. Recently, tales of these "monsters" have been corroborated by an increase in sightings, and out of these legends a new science has been born: cryptozoology -- the study of hidden animals. 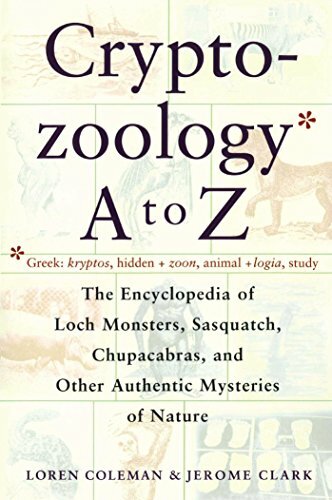 Cryptozoology A to Z, the first encyclopedia of its kind, contains nearly two hundred entries, including cryptids (the name given to these unusual beasts), new animal finds, and the explorers and scientists who search for them. 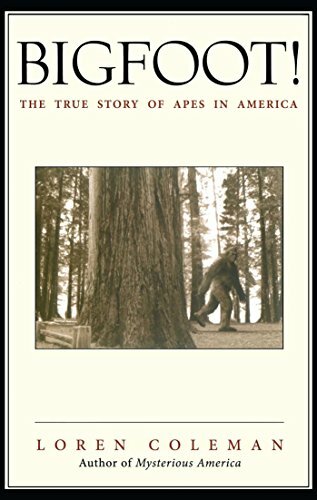 Loren Coleman, one of the world's leading cryptozoologists, teams up with Jerome Clark, editor and author of several encyclopedias, to provide these definitive descriptions and many never-before-published drawings and photographs from eyewitnesses' detailed accounts. Full of insights into the methods of these scientists, exciting tales of discovery, and the history and evolution of this field, Cryptozoology A to Z is the most complete reference ever of the newest zoological science. 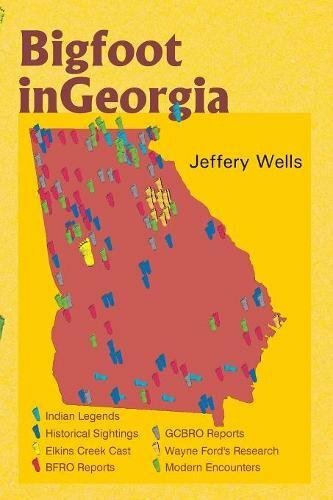 Jeffery Wells explores the mystery of Bigfoot in Georgia from the earliest Native American legends through the latest Bigfoot hoax. He reports on encounters throughout history, the Elkins Creek cast, and the fascinating people who are searching in Georgia today for clues about the elusive creature, better known for its exploits in California and the Pacific Northwest. There is little doubt that the state of Kentucky is one of the strangest places in the country. The "dark and bloody ground" of the Native Americans has given birth to accounts of UFO's, flying creatures, Lizard Men and even werewolves. But one monster stands out above the rest - Bigfoot! There are so many sightings of these hairy giants in the Bluegrass State that it has come to be ranked as one of the most active for Bigfoot sightings east of the Mississippi River! In his latest title, B.M. Nunnelly, author of Mysterious Kentucky, has collected Bigfoot reports, sightings and first-hand accounts from every county in the state, compiling a fascinating documentation of ordinary people and their encounters with the unknown. 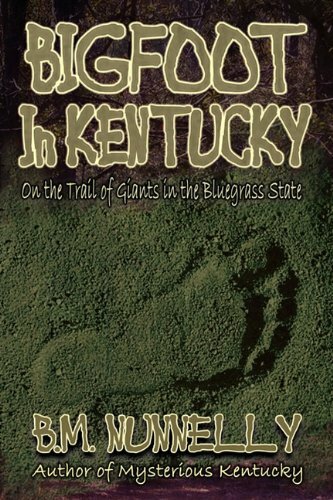 Delve into the long, strange history of Bigfoot in the Bluegrass State, from the "Wildman" reports of the 1800s to recent encounters in the forested regions of Kentucky, and find out why this is such a mysterious place. This is a book that is bound to satisfy your cravings for the unusual and may just have you roaming the woods and hills in hopes of an encounter of your own! Anyway, one of my friends, about two years older than I, absolutely REFUSED to go in the woods there. We'd romp around the pines everywhere and anywhere else, but he just wouldn't go in that part of the forest. This is even when we were older teens. See, he claimed that years prior he has seen ... something in those woods. A big, hairy man, face covered in hair, standing slouched in the woods staring at him. Near Lakehurst, New Jersey 1980s. Bigfoot shows up in some unexpected places. There are thousands of reports of encounters of Bigfoot type creatures in North America and the state of New Jersey has its share, with over 200 encounters reported in modern times. The Kittatinny Mountains and the Pine Barrens are two of the places in New Jersey where this unknown hominid has revealed itself most frequently, but sightings have also occurred in areas where one would least expect. Marlboro, Middletown, and Mahwah, are just three of the typically suburban New Jersey towns that have had more than one sighting in the relatively recent past. The Big Red Eye, the Big Hairy Man, the Bag Man and the Jersey Devil are some of the commonly used names of the Bigfoot/Sasquatch type creatures that have been seen or heard in the woods, swamps and occasional backyards of the Garden State. Whatever name it goes by, reports in New Jersey of encounters with wild hairy men date back to the 19th century and have continued into the present. Reports alone do not prove the Big Red Eye is lurking in the swamps of Mahlon Dickerson Reservation in Morris County, or that the hairy, bi-pedal version of the Jersey Devil, is watching you change your tire, on a moonless night, from just inside the tree-line along Route 72. Something strange is creeping through the forests though, so on your next hike through Allaire State Park, when the birds stop chirping, the bugs stop buzzing, the hair on your arms stands-up, and you feel like you are being watched, consider the experiences of others in that area that are described in the book, and head straight back to the car, then bar. 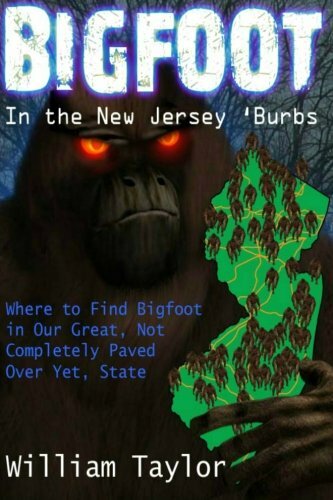 Bigfoot in the New Jersey Burb?s compiles the more modern sightings and encounters with Bigfoot like entities in the state and offers guidance for where these creatures can be found. We have broken the encounters into four broad sections, and examine historical and modern accounts in (1) North Jersey, (2) South Jersey, (3) Out of the Way Places and (4) a section we call The Turnpike. In each of the four major sections, we narrow down concentrations of sightings and encounters to General Areas of Interest, and then finally Hot Spots. Bigfoot in the New Jersey 'Burbs provides seasoned Bigfoot researchers, amateur Squatch enthusiasts and curious Jersey residents who think nothing fun ever happens in the state, with details of recent sightings and the reasons why these unknown two legged primates tend to be seen in specific areas. The book contains twenty-two maps, recent rarely seen track photos; real accounts of Bigfoot sightings, advice and techniques that will help the reader maximize their chances of running into a Bigfoot in our great but not completely paved over yet state. Like many reclusive celebrities, Big Foot is misunderstood. In his touching memoir Me Write Book he wants to set the record straight, proving that although he's larger, hairier, and more foul-smelling than most of us, he's really not so different underneath. Only the most coldhearted among us could look on without compassion as this hirsute Everyman struggles bravely with casual cannibalism, Pringles potato crisps, embarrassing moments with peach Schnapps, the desperate loneliness of personal ads, and philosophical quandaries. Readers will never forget the plaintive voice from the wilderness that howls from every page of this searing, intimate account of a man-beast in the promised land.